This is a HiFi phono preamp. finished at 08-Jan-2015,, it's support MM/MC(cartridge)type turntable. so. you can use it for all turntable player. it's very helpful, and i use many HiFi Electronic component on this product. Metal film resistors,ELNA Capacitance,gold RCA interface, VISMAY MKT Coupling capacitance. sound is very good. very low back noise. and sound is very clear. it's better then the T9 model. else, the preamplifier can work on 2 voltage mode. 110V or 220V(of course 120V or 240V), we will sent the correct to you by your address. and mark defaul voltage on preamp outside case. then you won't able to setup it work on wrong voltage. if you need move to other country. then you can open the case and setup it.one more thing. this preamp use Aluminum metal case. best quality.and nice look.you will enjoy it. in the end. when you got the product. and test it after. if you have any suggestion. please let me know. i will keep the good idear. and upgrade it in next version. 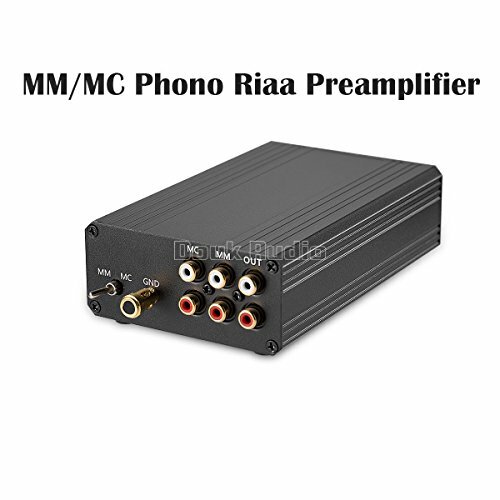 RIAA phono stereo The transformer with 110~120V and 220~240V both version. i will sent correct version to you by your address. Metal box version.very low back noise. sound is very clear. Work with 110V and 220V voltage. you can setup it. refer the picture. use many HiFi Electronic component on this product. Metal film resistors,ELNA Capacitance,gold RCA interface, VISMAY MKT Coupling capacitance. If you have any questions about this product by Little Bear, contact us by completing and submitting the form below. If you are looking for a specif part number, please include it with your message.